Unsure of your future? Seeking more than this world offers? Winning Life's Race: Messages With Meaning, offer insights and encouragement along life's journey for a closer relationship with God. Unsure of your future? Seeking more than this world offers? 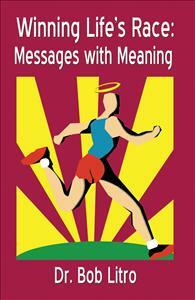 Winning Life's Race: Messages With Meaning, offer insights and encouragement for a closer relationship with God . Section 1: The Spirit of God presents faith-based stories, quotations, and prayers reminding us of God's faithfulness at all times. Section 2: Stories With A Message, shares stories of inspiration, encouragement and humor. Section 3: Living Life Fully, reminds us that our everyday choices often overlook those "little" things that ultimately mean so much. The answer to Winning Life's Race? A personal relationship with Jesus Christ. A very enjoyable and wise book. Each of the three sections contain insightful stories, anecdotes, quotations, and prayers relevant to living in the present moment with an awareness of our relationship with our Savior and Lord Jesus Christ. Entertaining, encouraging, and filled with wisdom, it is an easy read and a treasure trove of illustrations for speakers, teachers, and anyone seeking to become all that God intended! This book’s potential in both group and individual settings make it something everyone needs to have on their shelf of keepers! Original authors of the many pieces include C.S. Lewis, Andrew Murray, Adrian Rogers, Annette Hitte, Paul Harvey to name a very few.